New York (PRWEB) August 23, 2008 -- Inc. magazine ranked AgileThought, Inc., a full service provider of software development and implementation solutions, No. 160 on its 27th annual Inc. 500 list of the fastest-growing private companies in the U.S. The list is the most comprehensive look at the most important segment of the economy - America's independent-minded entrepreneurs. Companies such as Zappos, Intuit, GoDaddy, Under Armour, Jamba Juice, American Apparel, Oracle and hundreds of other powerhouses gained early exposure as members of the Inc. 500. "Receiving this recognition is a tribute to the talented team of professionals we have assembled at AgileThought," stated co-founder and CEO John Wagner. "This has been a tremendous four years for us where everyone on our team has worked tirelessly to solidify our culture and core values, to deliver innovative software solutions, and to build long-term relationships with clients from a variety of industries." Nationally Inc. magazine ranked AgileThought No. 8 among the top 100 software companies and No. 7 among the fastest growing private companies in the state of Florida. "If you want to find out which companies are going to change the world, look at the Inc. 500," said Inc. Editor Jane Berentson. "These are the most innovative, dynamic, fast-growing companies in the nation - the ones coming up with solutions to some of our knottiest problems, creating systems that let us conduct business faster and easier, and manufacturing products we soon discover we can't live without. The Inc. 500 list is Inc. magazine's tribute to American business ingenuity and ambition." AgileThought is a full service provider of software development and implementation solutions, with specializations in custom software development, data warehousing, application lifecycle management (ALM), and portal implementations. Formed in 2004, AgileThought serves clients nationwide from offices in Tampa, St. Louis, Chicago, and New York. Clients include PricewaterhouseCoopers, Microsoft, OSI Restaurant Partners, Kirkland & Ellis, and KPMG as well as other Fortune 500 companies. AgileThought has been recognized by the Tampa Bay Business Journal as one of the fastest growing private companies in the Tampa Bay area and has been recognized as one of the best places to work within the Tampa Bay area. AgileThought continues to advance in the marketplace through a philosophy that keeps its clients and employees as the main priority. Additional details about this growing company can be found at www.agilethought.com. The 2008 Inc. 500, as revealed in the September issue of Inc. magazine (on newsstands August 26 - September 30), reported aggregate revenue of $13.7 billion and median three-year growth of 1,046%. Total sales for Inc. 500 companies were 14 percent below last year's combined revenue of $16 billion; still, it was a stellar year for many companies. Not only did sales for this year's top 50 growers outstrip those of last year's top 50 by $541 million, but this year's fastest 50 also boasted a staggering 47 percent jump in average three-year growth from last year's top of the class. Additionally, the 2008 Inc. 500 companies were engines of job growth, having created more than 51,414 jobs since those companies were founded. Complete information on this year's Inc. 500, including company profiles and a list of the fastest-growing companies that can be sorted by industry and region can be found at www.inc5000.com. The 2008 Inc. 500/5000 list measures revenue growth from 2004 through 2007. To qualify, companies must be U.S.-based and privately held, independent - not subsidiaries or divisions of other companies - as of December 31, 2007, and have had at least $200,000 in revenue in 2004, and $2 million in 2007. Companies can apply for next year's Inc. 500/5000 by registering with "IncBizNet, Business Network for Private Companies", at www.incbiznet.com. About Inc. magazine Founded in 1979 and acquired in 2005 by Mansueto Ventures, LLC., Inc. magazine (www.inc.com) is the only major business magazine dedicated exclusively to owners and managers of growing private companies that delivers real solutions for today's innovative company builders. With a total paid circulation of 724,110, Inc. provides hands-on tools and market-tested strategies for managing people, finances, sales, marketing, and technology. About Inc. 500|Inc. 5000 Conference Each year, Inc. magazine and Inc.com celebrate the remarkable achievements of today's entrepreneurial superstars -- the privately held small businesses that drive our economy. The Inc. 500|Inc. 5000 Conference brings together members of the Inc. 5000 community--both a new class of Inc. 5000 honorees and the list's alumni--for three days of powerful networking, inspired learning, and momentous celebration. For the first time ever, this powerful networking event is open to all. Please join us September 18-20, 2008 at the Gaylord National Resort and Convention Center in Washington, D.C. For more information or to register, visit www.Inc500Conference.com or call us at 877-211-0489. Esquire Innovations, Inc. announced that iCreate 7 will be previewed at the International Legal Technology Association Annual conference held August 25-28. iCreate is Esquire's popular document production software designed specifically for the legal industry. (PRWEB) August 23, 2008 -- Esquire Innovations, Inc. announced that iCreate 7 will be previewed at the International Legal Technology Association Annual conference held August 25-28. iCreate is Esquire's popular document production software designed specifically for the legal industry. "With accuracy and turnaround critical elements, law firms must produce documents ranging in difficulty from simple memos to complex agreements, as well as disclosure documents and briefs," states Judye Carter Reynolds, Esquire Innovations' VP of Client Experiences. "This new version of iCreate provides a fully integrated system of templates and automation to construct documents with the click of a button, and on-screen prompts that ask the 'right' questions." iCreate 7 leverages MS Word's Native Architecture and promotes the best use of Word, drawing on the most effective features for legal documents instead of highly programmed customizations or substitute functions. Esquire uses the term Enhanced Native Architecture ™ (ENA) to describe their methodology of retaining the look and feel of the parent software dialog boxes, thereby promoting streamlined workflow and reducing end user training requirements. And, by retaining Word's native formatting capabilities, an electronic document can be used for collaboration purposes more effectively. "Firms that implement iCreate find they significantly reduce the time spent drafting, formatting and repurposing MS Word documents," according to Reynolds. After installing Office 2007, an Information Systems manager from a law firm in Boston stated she had a difficult time "finding things in Word [2007. But, when she installed iCreate, she was thrilled to find "it made using Word 2007 so much more intuitive." Designed to meet the high demands of the legal industry, with enhanced administration, a sleek user interface, template launcher, pleading administration, numbering and styles tools for formatting documents, an open XML document format compliancy and contact management integration with dynamic address updating, iCreate 7 has enormous capabilities for quickly creating, editing and standardizing legal documents. iCreate 7 is highly customizable by in-house staff without VBA experience. Reynolds reports "the package has a small application footprint, is simple to administer, can be implemented in a short amount of time, and the source code for customizable components is open." She adds that "the updating and customization of templates can be handled in-house, making upgrades inexpensive and quick to implement." Along with iCreate 7; Esquire is also previewing new versions of iScrub, a metadata management solution for Microsoft Office documents; iRedline, an enhanced Word comparison application; and iDocID, software for adding a document ID to a Word or Excel document. This new generation of products is also available as the combined package iOffice System 7. With clients worldwide, Esquire Innovations is a leading provider of Microsoft Office integration software geared to the legal market. To learn more about Esquire Innovations' products, call 951-506-5641 or visit www.esqinc.com. Esquire Innovations, Inc. will be previewing the new version of iDocID at the International Legal Technology Association Annual conference August 25-28, 2008. iDocID automates the insertion of a document ID into a document footer. (PRWEB) August 23, 2008 -- Esquire Innovations, Inc. will be previewing the new version of iDocID at the International Legal Technology Association Annual conference August 25-28, 2008. iDocID automates the insertion of a document ID into a document footer. "Leveraging Microsoft's new ribbon technology in Office 2007, iDocID 7 presents a custom ribbon for easy access," according to Randall Farrar, CEO at Esquire Innovations. iDocID 7 provides centralized administration for establishing the default behavior of a document ID, with options that include placement (all pages, first page, second and beyond and last page), format, elements, document type and a default document ID on all documents according to a firm's specifications. The software does not overwrite existing footer information and existing Document ID codes can be automatically eliminated upon File|Open. With the ability to work out-of-the-box with a legal firm's document management system (including Open Text, Interwoven, WORLDOX, Net Documents and native Word) and different document types, iDocID 7 provides functionality and flexibility. Along with iDocID 7; the company is also previewing new versions of: iCreate, a template and document production application; iScrub, a metadata management solution for Microsoft Office documents; and iRedline, an enhanced Word comparison application; This new generation of products is also be available as the combined package iOffice System 7. Esquire Innovations, Inc. announced the preview of iScrub 7 at the International Legal Technology Association Annual conference August 25-28, 2008. (PRWEB) August 23, 2008 -- Esquire Innovations, Inc. announced the preview of iScrub 7 at the International Legal Technology Association Annual conference August 25-28, 2008. iScrub is Esquire's metadata management software for the legal industry. Managing the metadata found in Microsoft Office and PDF documents is a critical requirement in the legal profession. Increasingly, law firms are realizing the potential risk of exposure if they do not utilize effective metadata management software. When required to provide electronic files as part of an discovery request, a firm with a metadata policy in place and the technology to enforce that policy, does not have to be concerned about delivering clean documents . Its internal policy already mandates what course of action should be taken and how the files will be treated. Firms need software to create clean copies of documents for external review based on firm policies not end user "policy." Already the industry standard, iScrub 7 takes metadata management to the next level. Taking full advantage of XML, .NET and zip technology, iScrub 7 removes the visible metadata and cleans the hidden or difficult to reach file elements. Through centralized administration, iScrub 7 allows firms to establish, protect and control the application settings. In addition, iScrub's sleek user interface means easy adoption for users. The ability to convert documents to PDF format after cleaning. Esquire reports that metadata continues to be a hot topic. Many firms who did not have a metadata solution have added iScrub to their desktops in the first half of 2008, joining the already 450 plus firms already using the software. "We are seeing firms who are new to metadata management software or wish to replace their current solution purchase iScrub," states Susan McClellan, Esquire Innovations' Marketing and Operations Manager. Esquire Innovations reports that along with iScrub 7; the company is also previewing new versions of iCreate, a template and document production application;; iRedline, their document comparison and collaboration application; and iDocID, software for adding a document ID to a Word or Excel document. This new generation of products is also available as the combined package iOffice System 7. With clients worldwide, Esquire Innovations is a leading provider of Microsoft Office integration software services and applications geared to the legal market. To learn more about Esquire Innovations' products call 951-506-5641 or visit www.esqinc.com. Esquire Innovations, Inc. announced that iOffice System 7 will be previewed at the International Legal Technology Association Annual conference August 25-28, 2008. (PRWEB) August 23, 2008 -- Esquire Innovations, Inc. announced that iOffice System 7 will be previewed at the International Legal Technology Association Annual conference August 25-28, 2008. Developed for the legal industry, iOffice System 7 includes: iCreate, templates and formatting tools for document creation and editing; iDocID, for adding document IDs to Word and Excel documents; iRedline, an enhanced word comparison application; and iScrub, for metadata management. iOffice System 7 can be implemented as a complete package, or each product can be purchased separately. "With seamless Microsoft Office 2007 integration, iOffice System 7 is what you need for efficient document production," says Randall Farrar, Esquire Innovations' CEO. All of the products leverage Enhanced Native Architecture™ (ENA) a methodology that Esquire developed that leverages native Word functionality. ENA retains the look and feel of parent software dialog boxes, while promoting streamlined workflow and efficiency and reducing end user training requirements. iCreate 7 encourages efficient, standardized document creation by providing ways to easily create automated templates for end users, and tools to quickly apply and make changes to styles, numbering and other MS Word formatting elements. Firms that implement iCreate find they significantly reduce the time users spend drafting, formatting and repurposing documents. Using ENA iCreate retains Word's native formatting, resulting in an electronic document that can effectively be used for collaboration purposes without concern that the formatting will be lost. Enhanced administration, more configurable than before. Out-of-the-box integration with Open Text, Interwoven, NetDocuments and WORLDOX. Ability to save documents in a PDF format after cleaning. With clients worldwide, Esquire Innovations is a leading provider of Microsoft Office integration applications geared to the legal market. To learn more about or evaluate Esquire Innovations' products, call 951-506-5641 or visit www.esqinc.com. (PRWEB) August 23, 2008 -- Esquire Innovations, Inc. announces that iRedline 7 will be previewed at the International Legal Technology Association Annual conference held August 25-28. iRedline 7 is a document comparison and revision collaboration tool for Microsoft Word documents. "Fully-integrated with Microsoft Word, iRedline 7 enhances document comparison in Word 2007," says Randall Farrar, CEO of Esquire Innovations. "As an add-on application to MS Word, iRedline result documents are in Word format so they can be easily shared, navigated or re-purposed. iRedline 7 is easy to install, maintain and deploy. Firm specifications are administered in a configuration XML file. Through the iRedline 7 administration, user options can be controlled, and firm standards can be deployed. An iRedline 7 comparison can result in a new document, attachment, related document, prepared as an e-mail attachment, saved as an attachment (embedded object) in the result document, or saved to the document management system. Users already familiar with Word's Track Changes find iRedline is the natural next step. It enhances Word's Track Changes by providing users with the ability to convert iRedline and DeltaView changes to tracked changes, create Change Reports, print only iRedlined pages and more. "Many firms would like to use Word's Track Changes and comparison tools, but don't because of their limitations and lack of features such as DMS integration. iRedline starts where Word leaves off, allowing firms to leverage the knowledge users already have with Word. It's a perfect fit," says Farrar. To learn more about Esquire Innovations' products, call 951-506-5641 or visit www.esqinc.com. New Book By Raleigh Lawyer Explains the Ins and Outs of Car Insurance. Raleigh, NC (PRWEB) August 23, 2008 -- Raleigh lawyer Ken Hardison has some simple advice for North Carolina motorists -- spend a few extra dollars on auto insurance and protect yourself from financial ruin. "Your life can be devastated if you have no way to pay your bills or living expenses when you're out of work for a year after a car wreck," Hardison says. Hardison, the senior partner at Hardison & Associates, often represents clients who have been injured in auto accidents. He says three of every four wrecks are covered by adequate insurance. It's the fourth case that can spell financial disaster. Most drivers don't realize their coverage is not enough until they're stuck with thousands of dollars in medical bills and other expenses. The best way to shield yourself, according to Hardison, is to bump up your underinsured motorist coverage, also known as UIM. Those benefits can cost just a few dollars a month, Hardison says, while providing up to $1 million in coverage. "UIM benefits allow you to tap into our own auto policy when another motorist who is at fault does not have enough insurance to pay for all of your damages," Hardison says. The ins and outs of auto insurance remain a mystery to most North Carolina consumers, says Hardison. To help clear up the confusion, he has written a new book, "The Ultimate Guide to Auto Insurance in NC." North Carolina residents can get a free copy by calling (800) 434-8399. Decoding your policy. Hardison explains the policy terms that are most likely to mystify consumers, including collision and comprehensive coverage. How insurers set rates. Insurance companies weigh multiple factors, including your driving record and where you live, when setting rates. Quotes from competing insurers may vary by hundreds of dollars. Hardison offers tips for holding your costs down -- and for finding the best deals online. The pain of points. Hardison explains why a single insurance point on your driving record can boost your annual premium by 20 percent or more. In the perfect world, consumers will never need their insurance, but accidents happen. That's why Hardison devotes a third of his book to what motorists should do following an accident -- from how to report the incident to pointers on getting your car repaired. Hardison says drivers should never shrug off a simple fender-bender. When hidden damages to the car or undetected personal injuries surface, the opportunity for filing a claim with your own insurance company may be gone. Even worse, the other party may have a change of heart about your handshake agreement -- and decide to file a lawsuit against you. "Simply stated, walking away and failing to report an accident to your insurance company is truly one of the worst mistakes you can make," Hardison says. "The Ultimate Guide to Auto Insurance in NC" is one of four books that Hardison or lawyers in his firm have written for North Carolina consumers. Other titles include: "9 Common Mistakes that can Destroy your Workers' Compensation Case," by Ben Cochran; "7 Fatal Mistakes Victims of Accidents Make in NC," by Ken Hardison; and "7 Costly Mistakes that can Ruin your Social Security Disability Claim," by Ken Hardison and Blair Biser. "I hope these books will educate people so they are not taken advantage of by corporations and insurance companies," Hardison says. "I want to level the playing field." Ken Hardison, known as the "people's lawyer," is the senior partner at Hardison & Associates and has spent the past 24 years building a highly respected North Carolina personal injury law practice. The firm has offices in Raleigh, Durham, Fayetteville, Dunn, Southern Pines and Wilmington. For more information, visit the firm's Website at http://www.lawyernc.com/index.html or call Ken Hardison in Raleigh at (919) 821-4004 or toll-free at (800) 434-8399. Email: ken @ lawyernc.com. Within days of a potentially damaging court ruling, Ontario Systems announces the release of its Validity version 1.0 product. The only fully integrated product specifically designed for the collections industry, it enables agencies to continue to work accounts with cell phone numbers both effectively and in compliance with recent judicial rulings. Muncie, IN (PRWEB) August 22, 2008 -- Within days of a potentially damaging court ruling, Ontario Systems announces the release of its Validity version 1.0 product. The only fully integrated product specifically designed for the collections industry, it enables agencies to continue to work accounts with cell phone numbers both effectively and in compliance with recent judicial rulings. A California court recently ruled that auto-dialers cannot call cell phones without the consumer's permission. Unless the credit grantor acquired permission to call a consumer's cell phone when the debt was incurred, third-party collection agencies risk litigation when calling consumers' cell phones. "Agencies incur a significant legal risk if they continue to call unauthorized cell phones," said Jason Harrington, product director for Ontario Systems. "But removing cell phone numbers from all dialing pools creates a likely drop in productivity and collections. Without this solution from Ontario Systems, collection agencies are in a very difficult position." Unlike other offerings, the Ontario Systems' solution meets the critical issues of both compliance and productivity. Since cell phone numbers are estimated to comprise between 15 and 35 percent any agency's phone number database, eliminating all cell phone numbers would obviously hamper an agency's ability to effectively work accounts. "This product is far superior to any other solution for this potentially damaging ruling," said Mike Meyer, vice president of sales for Ontario Systems. "It allows our clients to remain 100 percent in compliance while still maintaining their productivity levels." While Ontario Systems' applications already allow cell phone numbers to be eliminated from calling pools, the Validity 1.0 product offers a quantum leap forward in the ability to manage cell phone numbers more effectively. During pool builds the system will automatically validate entries in real-time against the cell phone number database. Cell phone numbers are flagged as authorized or unauthorized to call. User-level alerts will notify the agent if the account being worked has cell phone numbers that have not been authorized. This will alert the agent to request authorization from the responsible party and Ontario Systems' transaction recording product, the VoiceTrak product, will record the authorization and attach it to the account. The agent can request authorization for all accounts tied to the responsible party. The individual cell phone flag can be overridden at the client level. If a credit grantor gained permission to call cell phone numbers when the debt was incurred, the third-party collector can legally call this number. To learn more about how Validity 1.0 can assist your business remain in compliance and remain productive, please call 800.283.3227. Ontario Systems provides debt collection software to organizations that manage large volumes of accounts receivables. These include hospitals, collection agencies, collection attorneys and bankcard issuers. As the largest provider of receivables management products, including the Artiva, FACS and Guaranteed Contacts systems, Ontario Systems is recognized throughout the industry as the leader in technology and customer service. With operations in Indiana and Ohio, it is a privately held company headquartered in Muncie, Ind. For more information, visit www.ontariosystems.com. A federal jury rejected claims of intentional misconduct brought by the Securities and Exchange Commission against Ranko "Ron" Cucuz, the former CEO of Hayes Lemmerz International. Detroit, MI (PRWEB) August 22, 2008 -- A federal jury rejected claims of intentional misconduct brought by the Securities and Exchange Commission against Ranko "Ron" Cucuz, the former CEO of Hayes Lemmerz International. The SEC had alleged (Civil Action No. 2:06-CV-11935 - E.D Mich.) that in 2001 Cucuz violated securities laws relating to the company's year 2000 financial statements. The government further alleged that Cucuz had made misstatements to Hayes' auditors, falsified Hayes' books and records and aided and abetted the company in violating the securities laws. Contrary to several earlier media reports, the jury did not agree and in fact found in favor of Cucuz on each of these claim. They did find Cucuz to have been negligent in his handling of accounting issues, essentially saying they believed as CEO, Cucuz should have been aware of the actions of other employees in the company. U.S. District Judge Arthur J. Tarnow previously had thrown out additional claims brought against Cucuz by the SEC. "I always believed that the SEC overreached in pursuing me in this matter," Cucuz said following the verdict. "I always knew I did nothing intentionally wrong and I am pleased the jury has agreed." Cucuz, 64, stepped down as CEO of Hayes in August 2001 but remained on the company's board of directors until 2003. In September 2001, new management announced it would be restating its financial reports for 2000 and the first quarter of 2001. The SEC brought the civil case against Cucuz in 2006, alleging he had knowingly withheld information about the company's financial condition from its auditors and the public. A 10-person jury rejected those charges on Wednesday. Hayes Lemmerz of Northville Michigan is one of the country's largest suppliers of wheels and other automotive parts. This article will cover the key provisions of an agreement to distribute filmed entertainment, usually made between a producer or licensor ("Producer") of a motion picture and a distributor ("Distributor"). These agreements are critical to the process of filmmaking; without them, films would not be viewed by the public. This provision covers the specifications of the film to be delivered by the producer to the distributor. Will it be a color picture or black and white? What type of film will be used? (35 mm vs. 16 mm) How long or short must the film be? For feature films, it is typical for the distributor to require that the film be no shorter than 90 minutes and no longer than either 105 or 120 minutes. Producers with a bigger name, and hence more leverage, however, may be able to negotiate for more freedom when it comes to the acceptable length of the film. Lastly, the distributor will often require that the film be capable of receiving an MPAA rating of no more restrictive than an "R", or "PG-13", depending on the type and intended audience of the picture. It is important for the parties to agree on what territory or territories the distribution agreement covers. Some distribution agreements are for worldwide rights to distribute the film; others cover just domestic or foreign rights. This provision can also cover whether or not the producer is obliged to deliver a subtitled version of the film so it can be shown in foreign markets. The parties must agree as to how long the distributor's exclusive rights will last. This term is measured from the date of delivery. The distributor may also want to negotiate for a right to match any offer as to extending or renewal of the term. Here is where the agreement will lay out that whether or not the distributor is receiving the exclusive right under copyright and otherwise to exhibit, distribute, advertise, promote, publicize, market, sell, manufacture, license and otherwise exploit the picture in the territory during the term, in all forms of theatrical, free television, pay cable, subscription cable, and any other medium agreed upon by the parties. The scope of rights given to the distributor will vary from agreement to agreement. However, usually the right to advertise the film through commercials and billboards accompanies the right to distribute it. "Gross receipts" is a term used in the film industry to measure the success of a film. While there is a generally accepted definition of gross receipts, the agreement should nonetheless define the term. Usually gross receipts means "any and all gross sums actually received by the distributor, arising out of or in connection with the exercise of any of the rights herein contained." Minimum guarantee payments, advances, and/or security deposits are usually included in gross receipts. By contrast, "net receipts" should be defined as well. Generally speaking, the term "net receipts" is defined as gross receipts minus all distribution expenses. After providing these definitions, the agreement must spell out what percentage of the gross or net receipts the producer is entitled to and what percentage the distributor will keep. For instance, a common arrangement is for the producer to be entitled to 80% of the net receipts, and distributor entitled to 20%. This split is obviously negotiated by the parties. These are the most important provisions of a film distribution agreement. Other provisions covering distribution expenses, credits, representations and warranties, and termination rights should also be covered. But it is most important for the producers and distributors to first agree on the territory, the term, the specification of the picture, the rights granted, and the disposition of gross or net receipts between the two parties. Sarasota, FL (PRWEB) August 22, 2008 -- The Gulf Coast Terrorism Prevention Conference, a must-attend event, held annually in conjunction with Security Solutions International (SSI), the leader in Homeland Security will take place on September 15th - 19th in Sarasota, Florida. Hosted by the Sarasota County Sheriff's Office and sponsored by the FBI Criminal Justice Information Services Division, Detica, Universal Detection Technology and Saint Leo University, the conference will feature an eclectic and comprehensive program to be presented by leading security experts from the US and Israel. About Universal Detection Technology: Universal Detection Technology develops early warning monitoring technologies for protection against terror threats including spore detection technology for monitoring anthrax levels in lieu of possible attack. The company's licensed spore detection technology from NASA's Jet Propulsion Laboratory (JPL) is a precedent real-time continuous detection device for identifying abnormal levels of bacterial spores in the air, an indication of a possible anthrax attack. Universal Detection Technology's quest to license new technologies is based on transforming scientific applications into daily products. Also, the company provides consultancy services in post and pre incident planning, bio-terror detection for large events and drafting customized security plans against bio-terrorism. Publisher of the Electronic and print magazine the "Counter Terrorist"
Are You a Potential Victim of Lawfare? SSI's non-profit organization, "Protecting the Homeland", is our newest initiative in championing democratic processes. In the dynamic arena for counteracting Islamic extremism masked under the exploitation of civil liberties, many have fallen victim to Lawfare--the formula is predictable. So-called anti-terrorist organizations, aligned with Islamic extremism, blatantly abuse the laws, freedoms and loopholes of the most liberal nation on earth to help finance and direct the world's most violent international terrorism cells. Copyright © 2008 Security Solutions International; all rights reserved. By negotiating placement on the IRS' Currently Not Collectible (CNC) status The Tax Lady Roni Deutch and her law firm were able to cease collections against a group of taxpayers who owed the IRS over $2.6 million in aggregate. North Highlands, CA (PRWEB) August 22, 2008 -- In July 2008, Roni Lynn Deutch, A Professional Tax Corporation, successfully negotiated placement on Currently Not Collectible status with the Internal Revenue Service (IRS) on behalf of 55 clients who collectively owed $2.6 million in IRS back taxes. "The economy is on everyone's mind these days," claims The Tax Lady Roni Deutch. "Almost everyday there are news segments on the economy and a looming recession. Unemployment rates are at record highs and everyone around the country is feeling the effects of the poor economy. Some families are even struggling to meet basic living expenses such as food and transportation, and therefore can't repay their owed back taxes. These families are ideal candidates for what is known as placement on the IRS' Currently Not Collectible status." Currently Not Collectible status is a designation the IRS uses to indicate that it cannot collect from a particular taxpayer at that time. To qualify for the designation, a taxpayer must have filed all necessary tax returns and must not have the ability to pay their tax liability in full or through a monthly payment. To determine whether a taxpayer can pay in full or through monthly payments, the IRS reviews the taxpayer's monthly income and expenses, as well as the value of his or her assets. Typically, the IRS places a taxpayer's collection account into Currently Not Collectible status only after determining that the taxpayer cannot pay his or her back tax liability in full or does not qualify for a monthly payment plan because his or her income is exceeded by his or her expenses. "The 55 clients lived all across the country," stated Justin Hein, a Managing Attorney at the law firm. "Each client owed on average approximately $48,000.00, with the highest single tax liability being nearly $480,000.00. Most of the clients' cases were successfully concluded within one year, but it is important to remember that the amount of time it takes to negotiate a settlement with the IRS depends on a variety of factors, including how quickly the taxpayer can provide financial documents requested by the IRS." Once the IRS places a taxpayer's account into Currently Not Collectible status, the IRS immediately ceases all collection activity against the taxpayer. Thus, the IRS will no longer issue collection notices, notices of intent to levy, final notices, or a notice of levy. In addition, the IRS will immediately stop any active levies on bank accounts or income, or already in place wage garnishments. A federal tax lien may be filed, and interest and penalties will continue to accrue until the tax liability is paid in full or expires. Also, if the taxpayer's financial situation improves, the IRS can remove the individual from Currently Not Collectible status and ask them to begin making payments. "I strongly encourage taxpayers struggling with IRS back taxes to call my law firm," continues Ms. Deutch. "Sometimes people do not realize that they have options. The IRS is willing to negotiate, and even cease collections if you show them you cannot afford to fully repay your tax liability. The lawyers at my law firm are skilled at negotiating with the IRS and know how to get taxpayers the resolutions they deserve." Getting placed on the IRS' CNC status is only one of the various services that Roni Lynn Deutch, A Professional Tax Corporation offers. The firm has experienced tax lawyers specializing in tax debt relief through a variety of tax relief services including: Offer in Compromise, Installment Agreement, Wage Garnishment Release, Bank Levy Release, Revenue Officer Assistance, Payroll Tax Representation, Tax Account Review, and Full Pay Service. Qualifying for any of these tax relief services is dependent upon the independent facts and circumstances of each client. Millions of people recognize tax attorney Roni Deutch as The Tax Lady. She has been helping taxpayers nationwide resolve their tax liabilities for seventeen years. As an industry leader, she has saved her clients tens of millions of dollars and has helped thousands of families settle their back taxes. Roni Lynn Deutch, A Professional Tax Corporation is a nationally recognized law firm that has been helping clients find solutions to their back tax liabilities for seventeen years. To find out more about the law firm or its IRS tax relief services, visit their website at RoniDeutch.com or call 1-888-TAX-LADY. To learn more about The Tax Lady Roni Deutch you can visit her blog or YouTube profile. Leading Australian law firm sees lawyer 'mobile productivity' increase, plus work-life flexibility. Melbourne, Australia (PRWEB) August 22, 2008 -- Prominent Melbourne law firm Russell Kennedy has seen an increase in BlackBerry utilization for mobile working, and an associated improvement in document turnaround times, as a result of implementing BigHand Mobile (BlackBerry Edition) across the firm in 2008. 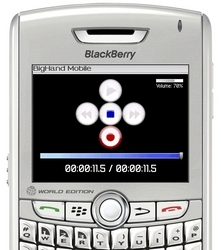 The BlackBerry digital dictation capability, together with other remote working options offered by BigHand, has also enabled both lawyers and secretaries to work from home when required; such as for maternity or to enable a better work-life balance. Bruce Stafford, Information Technology Manager describes: "The key to good technology management is making the most of the systems you have in place and the great thing about BigHand software is that it enhances our existing investment in BlackBerry wireless technology. Getting lawyers to use their Smartphone for dictation means document production is boosted by the instant nature of wireless technology, and the increased workflow visibility helps work sharing among office-based support. In terms of product selection, we originally looked at several products as software solutions but our use of BlackBerry technology meant BigHand were the most viable option." Following the BigHand BlackBerry project Russell Kennedy are now set to look at the Interwoven BlackBerry module, with both 'Best-of-Breed' systems also offering integration with each other and the potential for further efficiencies down the line. "The introduction of BigHand digital dictation has been a problem free exercise and has produced immediate benefits for our Team. It is a real "plus" to be able to direct your work to your secretary or the word processing staff, to prioritise work from your desk, to see what work is being typed at any particular time and to see where other dictation sits in the queue. We have found that we now send individual pieces of dictation for typing as they are dictated rather than dictating numerous letters and documents on the one tape and then delivering the tape to our secretaries or to WP. This "more immediate" transmission of dictated items inevitably leads to a quicker turnaround time. Overall, there have been no negatives and lots of positives." BigHand Digital Dictation software is used by four of the top five Australian law firms, as well as Crown Law QLD, Deacons Hong Kong, HWL Ebsworth, Gadens Lawyers, Gilbert + Tobin, Hicksons, and Keddies Litigation Lawyers among many others. As such BigHand is considered the Australian digital dictation market leader. Russell Kennedy is a prominent and highly respected Melbourne commercial law firm. The firm proudly counts among its clients some of Australia's leading corporations, government bodies, statutory authorities and local government organisations. The firm combines a number of key areas of legal expertise including banking & finance, building & construction, commercial litigation, employment & industrial relations, health & aged care, insurance, leasing, planning, environment and local government, property & development, transport & logistics and wills & estate planning. The firm's key objective is the provision of quality, practical and results oriented advice and representation. A Microsoft Gold Partner and BlackBerry ISV Partner, BigHand is based out of Sydney, London, Chicago and Toronto. BigHand is the leading digital dictation vendor in the global professional services sector. BigHand3 was awarded "Best of Breed System of the Year" at the Legal Technology Awards for 2008, and nominated as 'New Product of the Year' at the LTN Awards 2008. BigHand was named as the fastest growing legal software developer in The Sunday Times Microsoft Tech Track 100 league tables for both 2006 and 2005. BigHand was also recognised by Deloitte as one of the 500 fastest growing software vendors in Europe in 2006. Additionally BigHand was voted "Best Legal Office Technology System 2004" from votes from over 14,000 lawyers and IT managers across the legal sector at the LOTIE Awards. BigHand's leading product also won the Society for Computers & Law IT Award in 2003 for "the most outstanding application of information technology to the law". Further information is available at http://www.bighand.com. Exposing the Islamic threat to the US Constitution and democracy. Sarasota, FL (PRWEB) August 21, 2008 -- Andrew Whitehead, Director of Anti-CAIR (http://www.anti-cair-net.org/) will speak at the 3rd Annual Gulf Coast Terrorism Prevention Conference in Sarasota, Florida on Friday, September 19, 2008 in collaboration with Security Solutions International (SSI), the leader in Homeland Security. Whitehead's ceaseless dedication in fighting radical extremism in the US is channeled through the Anti-CAIR organization including frequent posts based on investigative reporting that exemplify the very essence of Islamic radicalism, including repeated attempts to threaten our constitutional freedoms. In presenting the Allah in America seminar, Whitehead will examine and discuss the founding of the Council on American-Islamic Relations (CAIR), CAIR's support of Islamist terrorists/terrorist groups and CAIR's manipulation of the main stream media. CAIR's legal tactics in support of Islamist terror will be presented, along with an outline of what each of us can to do "fight back". The conference, to take place September 15th - 19th, is hosted by the Sarasota County Sheriff's Office. Mr. Solomon Bradman, CEO and co-founder of SSI will speak on the first day, introducing and highlighting today's security issues. Proventsure's Identity Theft prevention and discovery software locates sensitive personal data at rest and integrates specialized search, discovery, reporting, deletion, and encryption capabilities. Washington, DC (PRWEB) August 21, 2008 -- Proventsure, a leader in automated Risk Assessment and Policy Auditing software to Fortune 2000 and Federal organizations, today announced the release of the free-to-download My ID Protector, enabling the mitigation of Identity Theft and data loss by discovering sensitive personal information on computers before it can be stolen. The Federal Trade Commission's Red Flag ID Theft Program rulings (72 Fed. Reg. 63717) with the November 1, 2008, implementation deadline, requires many organizations to implement Identity Theft Protection programs to detect and prevent identity theft of customer data that could be used to steal a consumer's identity. The ruling affects many financial, utility, educational, retail, and many other organizations. Consumer advocates hailed the original draft with the inclusion of a broad mandate to protect against 'possible risk,' including precursors of ID theft such as security breaches. Such language was moved in the final version to guidance section IV of the guidelines. Proventsure's My ID Protector has fully integrated tools enabling the cleansing of computers through discovery of sensitive data, encrypting or deleting sensitive files, examining file data, searching for similar content (e.g., SSNs or credit card numbers), and effortless assessment with simplified reporting. Algorithms used to map the Human Genome to discover "unknown and interesting" genes are used by Proventsure's Enterprise Data Loss Prevention technologies to discover "unknown and interesting" types of information. This enables the analysis engine to "learn" decoding techniques for many proprietary and unknown formats. "With the increase of malware targeting home users and their information, we felt it was imperative to give all people the same control over sensitive information that was previously reserved for IT Administrators," said Proventsure's EVP of Engineering, Kevin Douglas. "Proventsure is uniquely positioned to address the challenge of Red Flag programs," said company CEO, Gary Golomb. "My ID Protector meets requirements to audit the soundness of personally identifiable information handling. Additionally, Proventsure's enterprise audit platform, now in its third-generation, enables organizations to go further by automating probability of loss assessment and mitigation of risk to that information." My ID Protector has been hailed by users as 'extremely easy to use' and 'the highest performing and most accurate solution available.' The software was given 5-star ratings on more than a dozen software web sites within its first few weeks of release. For more information, please see http://www.proventsure.com/free-identity-theft-protection/index.htm or http://www.proventsure.com. For bulk discount information, contact concierge @ proventsure.com. We all know that accidents can happen anywhere, but what happens if an accident happens at work? Can you make a claim against your workplace? If an injury which occurred at work prevents you from fulfilling your job duties, can you take time off work until you are fully recovered? These are all common questions which are bound to go through a workers mind if they are the victim of a work accident. Understandably, many workers are wary of making a claim against their employer, fearing that such an action could have repercussions for them. In reality however, they should not be concerned. It is not legally justifiable to fire somebody for making an accident claim  and indeed any such action could be amount to unfair dismissal. It is the legal obligation of all employers to provide a safe working environment for their staff. For example, workers who are required to use dangerous machinery should be provided with protective equipment and should also be fully trained to use to machine. If a worker is injured through no fault of their own, then an employer could be deemed as negligent, and going against their duty of care. In many instances, an injury or accident could well have required an employee to take time off work or to suffer hardship. This can result in financial difficulties such as struggling with mortgage/credit card repayments. A large body of safety legislation has been built up to ensure that accident victims have a means to compensation in order to cover any financial losses which may have been a result of the injury. In most cases, compensation is awarded on a no win no fee basis which means that if the claimant is to win their case, the solicitors fees will be recovered from the losing side on top of any compensation award. In addition, all employers are required by law to take out public liability insurance to cover employee accidents. This means that it is the insurance company that will pay out any compensation, not the employer. Such claims are in fact relatively common and most employers will have factored such claims into their business models. It is important to remember that accident victims are entitled to make compensation claims. Many people are in pain or suffer financial loss after an accident. Their claims succeed because over the years ordinary people have been prepared to claim. In conclusion, it is an employees right to make a valid compensation claim against their employer without fear of losing their job. The National Accident Helpline are the UK's leading no win no fee specialists. All compensation claims are handled in complete confidence by our trained staff who refer personal injury claims to local solicitors. Car accidents can turn up to be very dangerous; result depends on the intensity of the accident. Automobile accidents that take place on highways involving heavy weight vehicles like trucks often result in fatality. Life seems to come at standstill after an accident. Car accident victims and their family members feel helpless to figure it out how to recover. Huge financial outlay for treatment, property damage, reduced income, job loss and mental trauma make life miserable. Monetary compensation becomes very essential at this point of time. But compensation does not come automatically. Car accident victims need to file compensation claim in court of law. The court then interferes and decides who is responsible for the accident. The sufferings of the victims are calculated and the responsible party is asked to pay the compensation. Like all the states, Florida also has strict car accident laws. These laws protect the right of Florida residents. If you fall prey to car accident, get yourself a senior accident attorney Florida and apply your rights. When you start searching for car accident lawyers in Florida, chances are you would become overwhelmed to see the number of helping hands extended towards you! Do not get nervous. A little bit of knowledge about car accidents and related laws can help you bring the situation in your favor. How to find a suitable lawyer? There are hundreds of lawyers in Florida; you surely would not hire all of them. While choosing a lawyers look for someone who is specialized in handling the type of case you are going to file. Accident lawyers can help you file lawsuit related to road accident, accident at work, slip and fall accident or any other form of accident. If you are going to file compensation claim for car accident in Fort Lauderdale look for car crash lawyers Ft Lauderdale. If the accident results in death you may need to consult wrongful death attorneys. Death of a person as a consequence of personal injury, accident or negligence is considered as wrongful death. Family members and keens of the killed person can file compensation claim to recover. Money crunch is quite common after car accidents. Victims need medical care, damaged car should be repaired and other responsibilities need to be carried out. Now, if the victim is unable to go to work, the family income is going to reduce. It becomes difficult to continue with normal lifestyle with the reduced income. Then how can you bear the cost of filing a lawsuit? Thats a valid point definitely. You would be glad to know that most personal injury lawyers and accident attorneys work on no win no fee or do not pay until you win basis. Claimants do not need to pay attorney fees or any set up cost. The accident attorneys collect their fees from the compensation amount on successful completion of the case. Sometimes claimants need to pay court costs initially. So talk to your lawyer and understand the financial matters thoroughly. To get in touch with competent accident attorneys look at attorney referral websites, local classified columns, directories and Yellow Pages; make a list of local attorneys and then choose the one who is most suitable for your case. Guaranteed Do Not Pay Until You Win with leading Ft Lauderdale Personal Injury Lawyer Boone and Davis. Find out more top Florida Lawyers and get latest legal advice. Among different forms of personal injury medical malpractice is perhaps most frightening and devastating. Negligence on the part of medical practitioners puts the life of the patients on stake. Patients are taken to physicians for treatment; it is very frustrating when the condition of the patient deteriorates because of the negligence and irresponsible behavior of the physicians, hospital or the clinic. Consequently the recovery process is elongated and the entire process becomes a lot expensive. All the states have incorporated laws to protect consumers rights against medical negligence. In Florida, medical malpractice laws are quite strict. However, along with protecting consumer rights, Florida medical negligence laws also look after the goodwill of the medical practitioners in Florida. Law makes it compulsory for lawyers to submit written statement confirming the fact that his or her client has a genuine case. If investigation proves that the case was built up just to insult a physician, the lawyer is held responsible for defaming the physician. Medical malpractice lawsuit can be filed in Florida court of law only when there is strong evidence supporting the victims. It is suggested that the victims consult Florida attorneys immediately after the medical negligence. Attorneys who have been working for medical malpractice victims for many years can be of great assistance to prove a genuine case in court. Competent attorneys obtain reports, records, statements and evidence from various sources and finally prepare the plan of action to establish the rights of the victims in the court of law. The job of a medical malpractice lawyer Florida is not easy. They need to overcome a lot of huddles. Apart from handling all the legal issues directly related to the case, they need to complete many more legal formalities. 1. Decide if the case falls under medical malpractice laws or not. Sometimes bereaved family members decide to bring medical malpractice case against the physician who was in charge of their near and dear one out of personal grievance. Hence, it becomes the duty of the medical malpractice lawyer to determine if the case has solid base or not. Cases filed to defame the physicians are not only dismissed, but the lawyers handling such case are held responsible as well. So the lawyers need to be careful while taking up the case. 2. Most personal injury, medical negligence and wrongful death cases go through no win no fee route. Hence, it is the responsibility of the medical malpractice lawyer or the law firm to bear initial financial matters and investigation expenses. Sometimes medical negligence cases go for years and the lawyer can recover their fees only when the case completes successfully. So the lawyers should be prepared to stand all the financial burdens. 3. Florida lawyers need to do feasibility study of each medical malpractice case properly before submitting the lawsuit in Florida court of law. They should invest their time and money only if there are enough chances of getting significant return. Otherwise, out of court settlements can be a wise option. 4. Lawyers handling medical malpractice cases should have some medical knowledge as well. They may also need to consult with physicians to understand the ins and outs of the case. Senior lawyers who have been overseeing medical malpractice cases for many days should be called on to prepare the right plan of action and to ensure success of the case. One personal injury case can turn into wrongful death lawsuit anytime. If the victim is killed as a result of personal injury or negligence of an individual or institute or organization, a wrongful death lawsuit is brought against the responsible party. However, unlike personal injury cases, here the compensation is paid to the dependants of the killed person. Any form of personal injury accident including automobile accident, slip and fall, work place accident, medical negligence and other such incidents can be the reason of wrongful death. Since recklessness and negligence of an entity ruins the life of another, victims have got all the right to file compensation claim in the court of law. In case of wrongful death, those who are financially dependent on the killed person are considered as the victims. Just imagine if the person on whom you depend financially, god forbid, is killed by a road accident wont you become helpless? Florida law helps such people by empowering them to claim compensation from the guilty party. Florida lawyers specialized in handling wrongful death cases can help wrongful death victims in Florida get compensated. It is true that the loss of a near and dear one cannot be compensated, no money is enough to balance the absence of a family member; still, monetary compensation helps surviving members get back on to their normal lifestyle. To file wrongful death lawsuit in Florida court of law, the family members and dependants of the killed person should take help from wrongful death attorneys who can guide them starting from evidence collection to presentation. Along with compensation, the feeling of getting justice reduces emotional suffering. Families suffering from wrongful death of a member have the right to receive compensation from the party responsible for the death. The responsible party can be an individual or an organization. Sometimes the surviving members are eligible for compensation from insurance companies as well. It is recommended to consult Florida wrongful death lawyers as soon as possible, so that the lawyer can guide the claimants on how to protect key and strong evidence and make the wrongful death compensation claim process much easier. Florida attorneys can also guide you learn the importance of Statute of Limitations (SOL) and help prevent your claim from going invalid by taking proper steps timely. If you or your acquaintances lose a family member due to irresponsibility and negligence of a third person, do not delay to see personal injury lawyers or wrongful death attorneys in Florida. While hiring wrongful death lawyer, make sure you deal with a skilled and experienced attorney. Those with years of experience in representing wrongful death claimants can be of great assistance. Laws related to wrongful death may vary from state to state. Florida lawyers understand the ins and outs of Florida wrongful death laws and can ensure success of the case. The members of victims family can be relieved by handing over all the legal issues to a competent Florida personal injury lawyer. Senior attorneys in Florida represent the case in court of law highlighting the rights of the surviving members of the victims family. Wrongful death lawyers educate their clients about their rights, collect reports and evidence properly and help claimants win the case. The compensation amount enhances the recovery process and brings back the surviving members to their normal lifestyle.